“Flat 60% off! Diwali Special” boasted the blinding red font on the window of FeatherLight Mattress Ltd., MG Road. They were the first to arrive. Her maroon bangles clinking as he playfully took her palm, stained with the dark maroon of mehendi patterns, and wrapped it up in his. The burst of sudden air conditioning, a welcome change for anyone who was out in the scorching summer heat. ‘They’ve probably travelled a long way to get here’ I thought, judging by their sweat stained backs. “This one!” the young bride said, breaking me out of my thoughts. She ran her palm along me slowly. “Let’s take this one” she said to him “Its perfect”. I loved her for saying that. The other mattresses looked back at me in envy. “But this one’s bigger”, he said, pointing to the mattress beside me. “But we don’t need a big one”, she whispered playfully, biting her lower lip to disguise her smile. “Okay then.” he chuckled, running his fingers through her hair as he called out to the salesman. And it was settled. I was taken from my air conditioned showroom in the heart of the city and into a dimly lit apartment that didn’t have much other furniture. But I didn’t mind. I had great company. 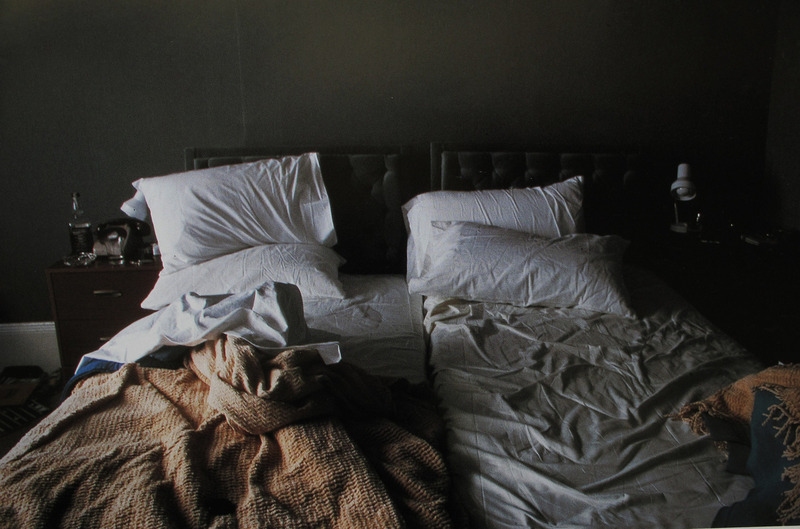 Abhi and Nina would spend hours on their bed, tangled up in each other the way only young lovers know. Their lives revolved around me. The modest queen sized bed forming their little escape from the rest of the world. They’d eat their meals, watch tv, read and work on it, warming themselves on cold nights with nothing more than an old blanket and peals of laughter. They’d laze around for hours, share stories, songs and secrets, staying awake until their heavy eyelids finally surrendered to gravity. They’d fall asleep as one, like two pieces of a puzzle, their bodies filling in each other’s curves and crevices with effortless perfection. Their rhythmic breaths so in sync, it was often impossible to tell they were two people. As the years went by, the house got more beautiful. They could finally afford a dining table, a couch, a heater to battle the harsh winters. The rickety old tv, a wedding gift from Abhi’s uncle, was replaced with a glossy flat screen and the blinking tube light in their bedroom was extinguished to make space for a sultry warm yellow. Abhi started working late. Nina would be asleep when he got home, never noticing the bed creak in protest when he got under the covers. They had their own blankets now. The air in the room heavy with emptiness and floral room freshener. Over the years, the heaters made the winters a lot less cold, but it always felt a lot less warm. One afternoon, I woke up from deep slumber to the sounds of playful laughter, gentle whispering, hurried shuffling between the sheets. Sounds I hadn’t heard in years. My heart leapt. ‘Finally!’ I thought, the familiarity of it all overwhelming me. Until, I realised something was different. I noticed she didn’t smell like Nina. She didn’t have Nina’s shy giggles, or her careless, uninhibited laughter. I noticed the bottle of white wine beside me. Nina only drank red. I felt betrayed. It kept happening. I aged faster, carrying the weight of Abhi’s secrets on my aching springs for months. I tried to tell Nina. Absorbing the other’s woman’s strong musky perfume into the bed linen, hiding her long strands of hair between the creases of the sheets in the hope that she’ll notice. But she never did. My age started to show, the cushioning in my body was clotting up on the sides, my springs started creaking louder. I could tell they were getting tired of me. One day, two men came home to pick me up. I looked around startled, wondering where I was going to be taken. Abhi looked at me expressionlessly one last time. Running his palm along memory lane. He was letting go of the only one who knew all his secrets, his fears, his stories. I looked back at the house, my heart aching to be back in the old, dimly lit apartment. But this house was beautiful. Delicate china, open kitchen, wooden flooring. I realised I simply didn’t fit in any more. A modest, aging, queen sized bed was of no use to them. Nothing but a heart breaking reminder of the past. Of happier times when all they ever needed, was one another. And a place to sit. Abhi watched silently as they carried me through the door. I took a deep breath, soaking in the warm sunlight for the first time in many years. I saw him look out of his window while I was being loaded into the truck and driven away. I could tell we both felt a little lighter. Love the little details you add in your short stories 🙂 This one is also very nice as usual. My favourite line:They’d fall asleep as one, like two pieces of a puzzle, their bodies filling in each other’s curves and crevices with effortless perfection. Wow! what a wonderful read! Loved it! Beautiful writing that keeps me guessing as always. That post has just inspired me to improve my writing. Good job!! Wow! What I just found,. Your writing is great. You have a unique way of writing! Keep writing.. keep inspiring! !